I listened to an interview on WBAI’s evening news podcast while folding laundry tonight. One segment was an interview with the author of the article reproduced below on the controversial Carrier IQ application which spies on smartphone owners. About 150 million smart phones in this country have built-in software capable of transmitting data such as user names or passwords to the service provider or the software publisher. The software also transmits information such as signal strength and location, of obvious use to the carrier, except that it’s your location going into the database if the phone is in your pocket. The program is called Carrier IQ and runs undetected in the background on these phones. It can't be turned off or removed by the user. In fact, according to the interview, some users may have "consented" to having data collected when they agreed to the EULA (End User License Agreement) necessary to use the phone. The spyware reports each user's location, so not only does your carrier have a database of what you did, but where you were when you did it. Did you use your smartphone while driving? Guess what--you're on record. Also, the software is not limited to just the United States. Other countries have adopted our standards. It's likely in the phones used by protesters in the Mid-East, for example. My thought: Even if carriers agree to turn off the software, who can guarantee that they will not turn it on in the future, perhaps at the request of authorities? Or that your personal data will not be sold to a third party? Let’s turn now to an article from the website of the Electronic Frontier Foundation. 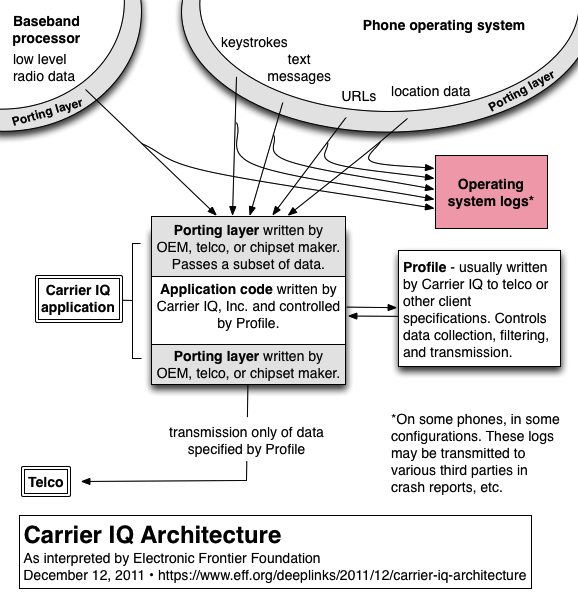 The article is Some Facts About Carrier IQ and is located here. This work is licensed under a CC 3.0 United States License. thanks, that was really well laid out (and the graphic picture actually made sense to me! ).